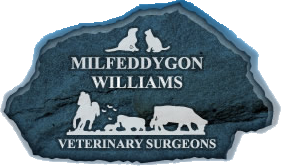 Williams Veterinary Surgeons have practices in Machynlleth, Tywyn and Barmouth. Established in 1983, we provide a wide range of veterinary services for large animals (farm animals), domestic animals (pets) and horses. With a veterinary surgery in the family home near Tywyn, Gwynedd and at the village of Cemmaes Road near Machynlleth ½ hour away Edward Williams provided veterinary care to a large rural area using locums to assist in the busiest times of the year. Edward and Marian have 2 children, Margaret and Hugh, who enjoyed their childhood on the busy family cattle and sheep farm. They both showed a strong interest from an early age in veterinary work and in 2000 and 2001 respectively they qualified as veterinary surgeons. They returned to help Edward develop the practice further whilst preserving the very traditional approach to mixed veterinary practice of reliable and friendly service to the rural community and maintaining good out of hours care for farmers and pets. After 25 years of working out of the family home we decided to build a purpose built veterinary surgery in Tywyn to accommodate the facilities required to offer a better service to our clients. This modern surgery is a dream come true for our family. Looking for vets in Machynlleth, Tywyn or Barmouth? Trust Williams Vets.